Working – a song cycle giving a glimpse into the life of ordinary working people in America – opened at Southwark Playhouse for a strictly limited run earlier this month. The basis for this collection of mini stories are interviews conducted in the 1970s. Add Stephen Schwartz and Lin-Manuel Miranda (amongst others) to the mix and you have a pretty solid basis for a stellar show. Working features a cast of six established musical theatre performers: Peter Polycarpou, Dean Chisnall, Liam Tamne, Krysten Cummings, Siubhan Harrison and Gillian Bevan. They are joined by six new drama school graduates who are making their professional debuts in this production. 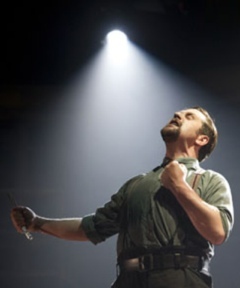 There is no weak link in the cast and everyone on stage gets the chance to shine. I was particularly impressed by Peter Polycarpou’s “Fathers and Sons” and Dean Chisnall’s “Brother Tucker”. 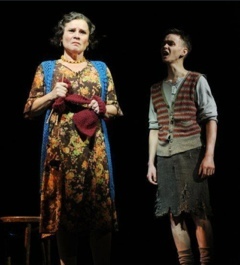 I also have to mention Gillian Bevan’s showstopping number about life as a waitress and Liam Tamne’s superb comic timing both as a delivery man and a call center agent. And special mention for Dean Chisnall’s appearance as both a golfer and a UPS man. Every scene, no matter how short, is a small highlight and I left the show with a big smile on my face because I knew I had just witnessed something very special. In this show you will find stories of teachers and construction workers, of waitresses and truck drivers, of firemen and housewives – Working gives America’s working community a voice. It tells the audience about their struggles, their hopes, their fears and their dreams. With a dazzling mix of musical styles and gripping choreography by Fabian Aloise this is a show that manages the leap between a relevant message and an entertaining night out. Working feels raw and real and beautifully honest. Working is running at Southwark Playhouse until July 8th 2017. For more info and to book tickets visit http://southwarkplayhouse.co.uk/show/working/. The Pajama Game is one of those shows that are not put on stage a lot. And at first view the story does come across as a bit too simple and foreseeable and its characters seem slightly too one-dimensional. However, if you take a second look you will understand that this is indeed a musical gem that deserves to and should be seen. The Pajama Game tells the story of Sid Sorokin, the new superintendent of Sleep-Tite Pajama Factory, and his love interest Babe Williams, the leader of the Union Grievance Commitee. Their relationship is put at risk when the employees are denied a seven-and-a-half cents an hour raise. As mentioned before, the story is simple and its ending is crystal clear right from the start. The characters are stereotypes but this works for the show. What really stands out in this show is the score by Richard Adler and Jerry Ross. I still catch myself humming songs from the show now and then and considering I’ve never listened to any of them before watching the show that is pretty remarkable. The star of this production is the complete cast. They are what makes The Pajama Game such a wonderfully entertaining show. 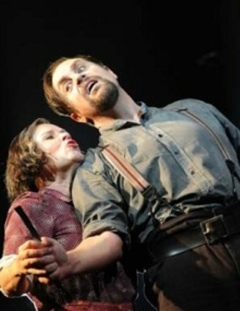 Hadley Fraser shines as Sid Sorokin. He seems so completely at ease with the character he plays and everything he does looks absolutely natural. You get the feeling he doesn’t even have to put a tiny effort into portraying Sid – which is probably not true but it’s great to see an actor so completely on eye-level with the character he plays. His singing is flawless and he manages to capture every aspect of Sid perfectly. Plus everyone who sings such a stunning duet with himself deserves extra praise And I have to mention his outfit for the bows and the encore – nice! I’m not saying anything more about that in case you haven’t seen the show yet. Joanna Riding plays Babe and she is just as perfectly cast as Hadley. Her Babe is feisty, stubborn and lovable. Her and Hadley portray a couple who face the struggle of combining a relationship and being in different “teams” at work. 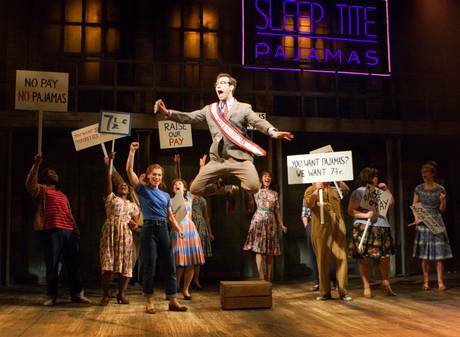 Their on stage chemistry dominates the show and gives The Pajama Game the needed depth. Peter Polycarpou is the obsessive factory timekeeper Vernon Hines who is struggling to contain his jealousy when it comes to secretary Gladys (played brilliantly by Alexis Owen-Hobbs). 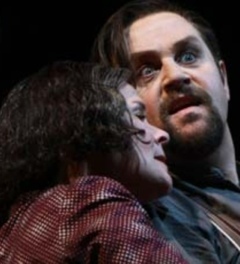 His “I’ll never be jealous again” proves to be one of the show stopping songs in the show. Eugene McCoy finally gets to show off his funny side (much-needed after playing the rather stoic Jersey Boy Nick Massi for three years) and manages to steal more than one scene as Prez, the head of the Union. The talent in the whole cast is visible throughout the show. 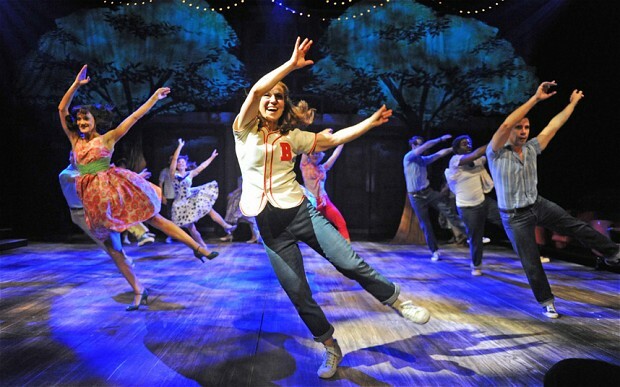 From the leads to every single ensemble member – these boys and girls can sing, dance and act. They make Stephen Mear’s choreography a complete joy to watch. And they are the ones who bring every scene to life, from the pajama factory to a sleazy night cub – the audience is transported into the world of Sid, Babe and co. The sets are quite simple but effective. And it’s great to see how a rather tiny performing space like the Minerva Theatre can provide room for a show with quite excessive dance routines without ever losing the intimacy this show needs to work properly. 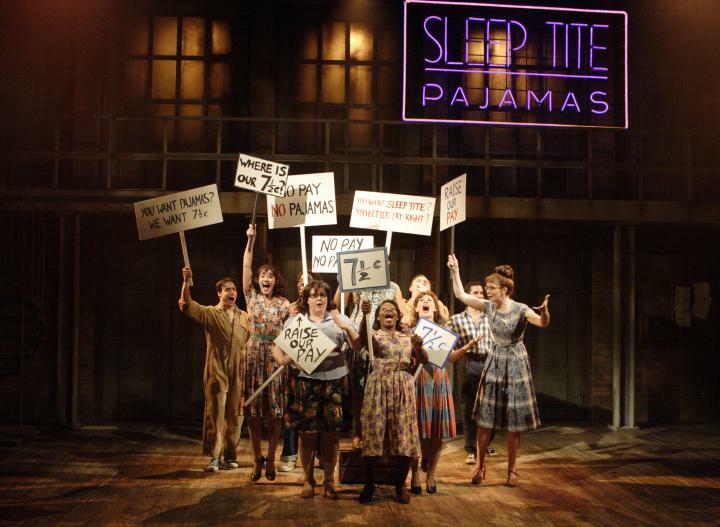 If you love shows like Guys and Dolls you will most likely adore The Pajama Game. This show bursts with energy and just the chance to see such an amazing cast work together in an intimate venue alone is worth the trip to Chichester. So, count yourself lucky if you have a ticket to one of the few remaining performances. Otherwise I’m sorry to inform you that the run is sold out – but you never know, Chichester is known for transferring popular shows to the West End.